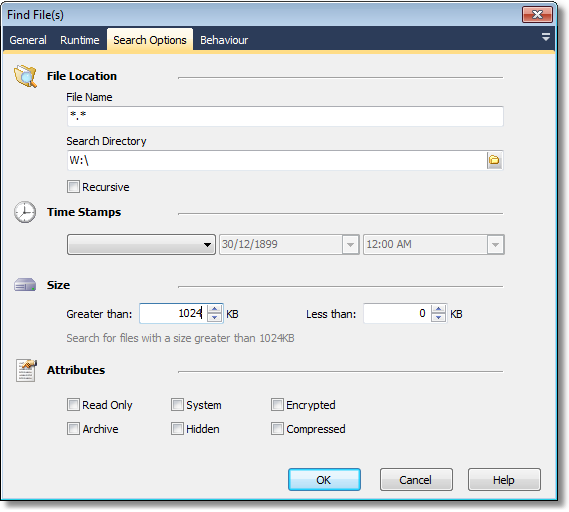 The Find File(s) action enables you to search for files matching a specified search criteria. The file spec used during the search. The value can contain the * or ? wildcard operators. The directory to search in to find the required files. The * or ? wildcard operators can be used to recursively search a directory tree, but doing so may slow down the search dramatically. Enables searching of files matching the specified time stamps. Allows files to be found matching a certain size. Allows file to be found based on the attributes set. Alters the behaviour of the action regarding the success or failure when files are found.